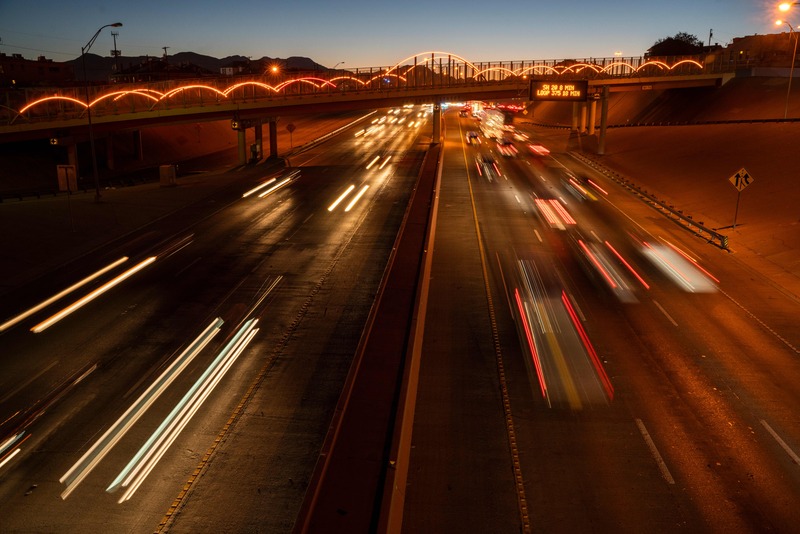 / Cars zoom past during rush hour on Interstate 10 after sunset in El Paso, Texas, on November 27, 2018. In this week’s edition of Science, eleven researchers from prominent universities around the US criticized the federal government’s justification for rolling back vehicle fuel economy standards. They wrote that the economic assumptions made in the government’s 2018 report resulted in a “flawed” analysis that will likely result in more traffic fatalities, more congestion, and more greenhouse gases emitted. EPA’s Greenhouse Gas (GHG) standards for light trucks and passenger vehicles, which paralleled the Corporate Average Fuel Economy (CAFE) standards from the National Highway Traffic Safety Administration (NHTSA). These two regulations (the GHG and CAFE rules) both aimed to force automakers to adhere to gradually-tightening fuel efficiency standards, which were detailed out to 2025. The EPA under Administrator Scott Pruitt spent most of 2017 laying the groundwork to rescind the GHG rules, saying the rules were onerous for automakers. But it’s hard to rescind and replace existing law—agencies need to justify their decisions with robust studies showing that a rules change will improve the livelihood of Americans, whether in health or in jobs. After Pruitt resigned amid investigations into his spending at the agency, former coal lobbyist Andrew Wheeler became acting administrator. Wheeler soon released an EPA report justifying a proposed rule to freeze fuel economy standards at 2020 levels. The EPA’s lengthy technical analysis stated that better fuel economy rules would be costly for companies. Those costs would be passed on to consumers, and those consumers would put off buying new cars with better safety features, causing accidents that would cost more than 12,000 lives. The EPA also argued that if fuel economy standards are left in place, people will be able to spend less on gas, which means they would drive more, meaning greenhouse gas emissions and driving in general might not reduce as much as expected. This so-called “rebound effect” has been well-studied in scientific literature, but economists and public policy researchers are extremely skeptical of how the current administration has applied it. Thursday’s letter said both the Obama Administration’s 2016 justification for its fuel economy standards and the Trump Administration’s 2018 report are both flawed, but the latter is more deeply flawed than the former. “Although we do not endorse the 2016 TAR [Technical Assessment Report], the 2018 analysis failed to advance our understanding of the true costs and benefits of fuel economy standards,” the researchers wrote. The EPA’s same emissions standards offered a net benefit of $97.2 billion in 2016, as opposed to a net loss of $200.6 billion in 2018. The authors of the 2018 report estimated benefits almost twice as large as in the 2016 analysis, but those benefits were outweighed by costs that were five times as great. One of the most egregious differences centered on how the EPA estimated the projected fleet size of cars and trucks out to 2025. In their Thursday letter, the researchers explained that one of the primary and most egregious differences between the reports centered on how the EPA estimated the projected fleet size of cars and trucks out to 2025. Tighter fuel economy standards lead to more expensive cars as well as more expensive used cars, the letter says. That would mean that the total US vehicle fleet would shrink if fuel economy standards are kept in place. On the other hand, freezing the fuel economy standards would increase the total US vehicle fleet as the US economy grows. But oddly, the EPA’s 2018 report says that freezing fuel economy standards will shrink the US vehicle fleet. “This is inconsistent with basic economic principles,” the researchers wrote, adding that the EPA’s most recent model has erased about 6 million projected vehicles with little explanation. Such a model “leads to misleading conclusions related to the overall size of the fleet, fleet composition, and the amount of scrappage; and undermines EPA and NHTSA modeling efforts to improve the understanding of the costs and benefits of fuel economy standards,” the letter says. Correcting that underestimation of vehicles almost entirely wipes out any reduction in crash fatalities that the EPA estimated, the researchers wrote. After all, more cars on the road means more crashes. Another problem with the 2018 report is that it only estimates benefits of reducing carbon emissions to the US; it doesn’t estimate any international benefits associated with reducing the social cost of carbon. The 2018 report also over-estimated the costs of compliance that automakers would have to shoulder to meet the new standards. For example, the latest report didn’t model any compliance flexibility into the costs of the standards. But in fact, automakers can transfer fuel economy credits between car models, so that over-compliance in one model can be “shared” with under-compliance in another model. However, this wasn’t reflected in the 2018 report. Additionally, the 2018 report does not address some technology options for meeting the standards cheaply. “Atkinson engines with cylinder deactivation and exhaust recirculation” is one example of technology left out of the EPA’s most recent model. In 2016, Toyota’s Prius C’s were using Atkinson-cycle engines, so it seems like a significant oversight to ignore the potential that that technology offers. In the same vein, the 2018 report assumes battery costs on electric vehicles that are 20 to 50 percent higher than what the 2016 report showed. For example, the researchers said, the most recent report estimated battery “electrode thickness limited to 100 microns” and included “additional vehicle electrification components” like liquid cooling systems. All these assumptions drive costs up and are likely not reflective of reality. “Given the substantial departure from a comprehensive protocol for benefit-cost analysis, we cannot conclude that the rollback will produce welfare gains, and we instead predict that it will result in unintended consequences,” the researchers wrote. “A rollback is an unnecessarily blunt way to achieve the same goal and introduces regulatory uncertainty into an industry that needs to make long-run technological investments for the future,” the letter concluded. Science, 2018. 10.1126/science.aav1458. (About DOIs).